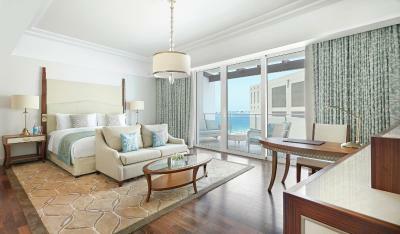 Lock in a great price for Waldorf Astoria Dubai Palm Jumeirah – rated 9.1 by recent guests! Wonderful staff. And the dinner at Social restaurant was special. suite are very big.. and have Complimentary Breakfast inside a Lounge Terrace bar at the same floor, with Amazing view and less people then on the Breakfast room .. so very quite and elegant. 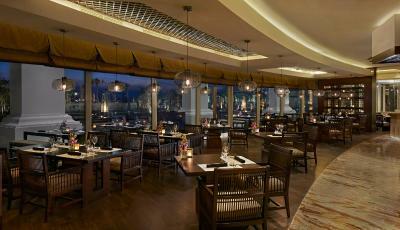 Excellent facilities, rich breakfast, friendly staff, sunset view from the room was magnificent. The service was incredible and Mark at the main desk was so accommodating. It was our anniversary and he allowed us to stay in our room a little longer which we were very appreciative of. The evening meal next to the beach watching the sunset was incredible and everyone has been so friendly! Great view !!!!! Burj Alarab + the whole dubai ski line was in front of me. The resort is comfortable and I liked the kids club facility. The property is near to the sea and the view is breathtaking. 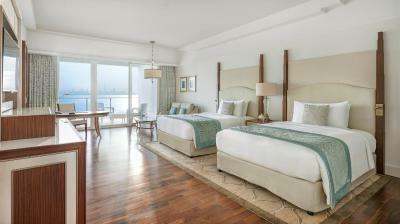 Waldorf Astoria Dubai Palm Jumeirah This rating is a reflection of how the property compares to the industry standard when it comes to price, facilities and services available. It's based on a self-evaluation by the property. Use this rating to help choose your stay! 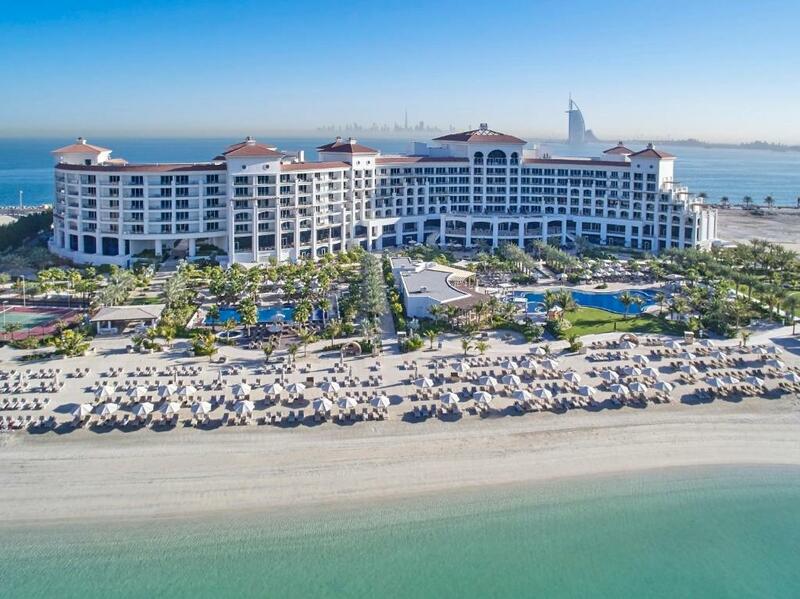 Located on the world famous Palm Jumeirah, Waldorf Astoria Dubai Palm Jumeirah features luxury rooms and suites with panoramic views of the Arabian Gulf. This elegant beach resort offers a 600 feet private beach, 2 temperature-controlled swimming pools, water sports activities, tennis courts, Kids Club and a Waldorf Astoria Spa. Guests can enjoy free WiFi acess in the whole property. 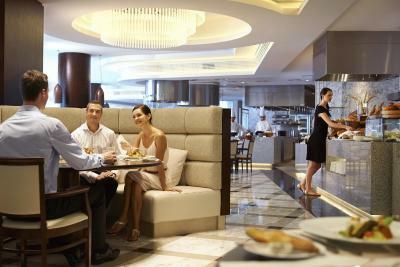 Guests can choose from 6 restaurants and bars for a diverse dining experience with Arabic-inspired cuisine at Mezzerie, Southeast Asian flavors at LAO or fine-casual dining at Social by Michelin chef Heinz Beck. Palm Avenue restaurant and lounge features a terrace with private cabanas where cocktails and international dishes can be enjoyed. Serafina Bar offers a signature cocktail list and live entertainment in the evenings. 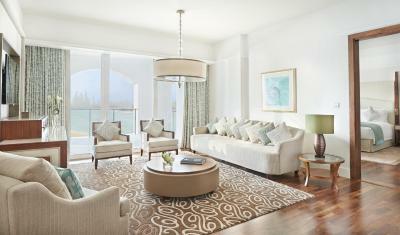 Dubai Marina is a 10-minute drive from Waldorf Astoria Dubai Palm Jumeirah. Burj Khalifa and the Dubai Mall are 30 minutes away by car. 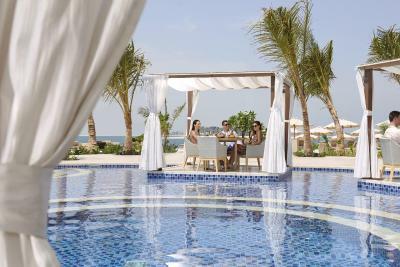 Dubai International Airport is 35 minutes from the resort. 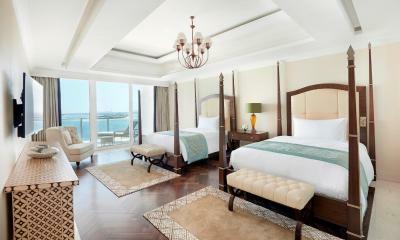 When would you like to stay at Waldorf Astoria Dubai Palm Jumeirah? 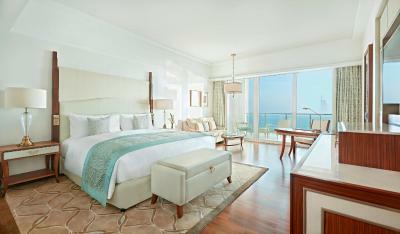 Experience exceptional views of the azure Arabian Gulf from the balcony of this elegant room. Enjoy a comfortable seating area, a work desk, and two queen-sized signature Waldorf Astoria beds. 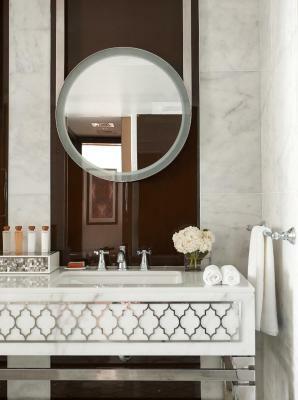 Refresh in the stylish marble bathroom with double vanities, a large bath and separate walk-in shower. Contemporary amenities include a 42-inch HDTV, i-docking station, a coffeemaker and WiFi access. Assigned Personal concierge to ensure guest experience. Sleeps up to 4 people. • Private balcony with panoramic views of the Arabian Gulf. 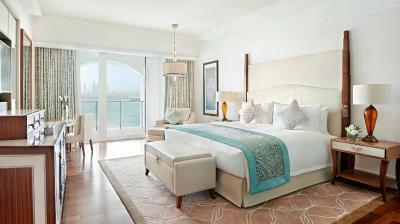 • A signature Waldorf Astoria king bed and pillow menu. • A separate bedroom, living room and a work station. • 42’inch flat-screen TV with satellite channels. • Marble bathroom with double vanity units, separate bath tub and a walk-in shower. • Multiple telephone lines with direct dial. • Free access to the fitness center and Spa facilities. 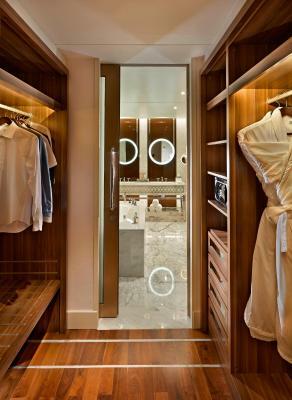 • Interconnecting rooms are subject to availability. 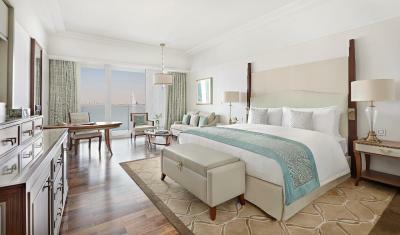 You’ll find beautiful views of the Arabian Gulf and world-famous Dubai skyline from the balcony of this spacious deluxe room featuring a comfortable seating area, work desk, and two queen-sized, signature Waldorf Astoria beds. Freshen up in the stylish marble bathroom with double vanities, large bath and separate walk-in shower. Enjoy the convenience of a personal concierge and contemporary amenities such as a 42-inch HDTV, idocking station, coffeemaker and WiFi access. Sleeps up to 4 people; interconnecting rooms are subject to availability. 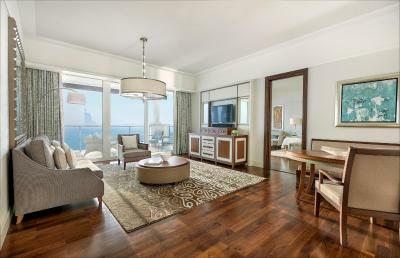 With uninterrupted views of the Arabian Gulf from the spacious balcony of this Premier Suite, guests can enjoy a separate living room and a private bedroom, featuring a signature Waldorf Astoria king-sized bed and a walk-in closet. Entertain in style, with a dining table and a comfortable seating area. 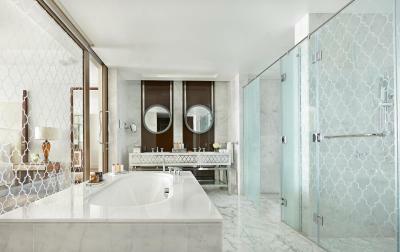 The marble bathroom features a luxuriously large bathtub, separate walk-in shower, and double vanities. Other contemporary amenities include a 42-inch HDTV, i-docking station, coffeemaker and WiFi access. Sleeps up to 4 people. Interconnecting rooms are subject to availability. Enjoy exclusive access to the Waldorf Astoria Lounge - a private oasis offering fabulous views, complimentary continental breakfast, a selection of refreshments throughout the day, afternoon tea and drinks in the evening. 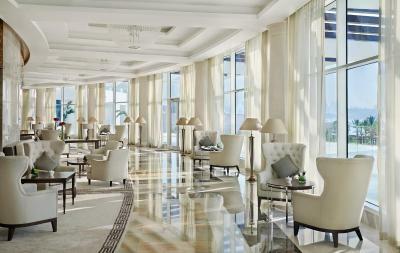 Children aged 12 and over are welcome at the Waldorf Astoria Lounge from 5:00pm onwards. 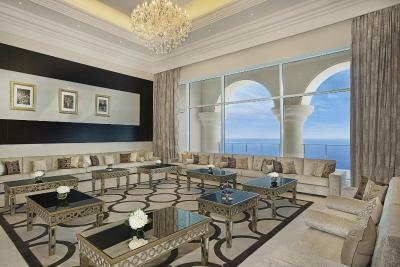 With exceptional views of the azure Arabian Gulf from the balcony of this elegant room, guests can enjoy a comfortable seating area, a work desk, a spacious walk-in closet and a signature Waldorf Astoria king-sized bed. Refresh in the stylish marble bathroom with double vanities, a large bath and separate walk-in shower. Contemporary amenities include a 42-inch HDTV, i-docking station, a coffeemaker and WiFi access. Assigned personal concierge to ensure guest experience. Sleeps up to 3 people. Interconnecting rooms are subject to availability. 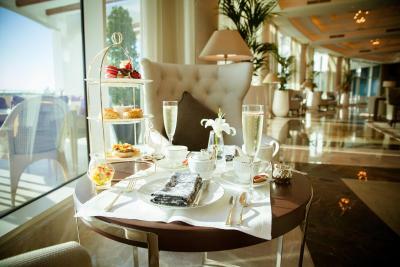 - a selection of refreshments throughout the day, afternoon tea and drinks in the evening. 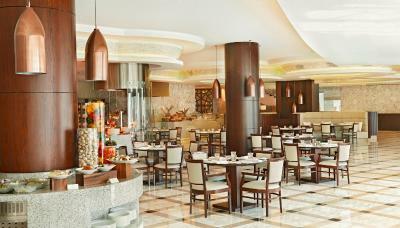 Children aged 12 and over are welcome at the Waldorf Astoria Lounge from 5:00pm onwards. 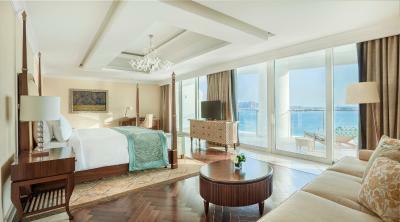 This exceptional suite offers a majestic Arabian Gulf view from the balcony. Enjoy exclusive access to the Waldorf Astoria Lounge, a private oasis with fabulous views, and complimentary breakfast, drinks and snacks throughout the day. 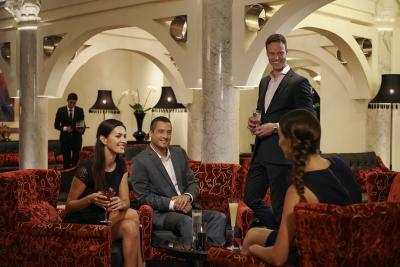 Children aged 12 and over are welcome at the Waldorf Astoria Lounge from 5:00pm onwards. Entertain at the dining table or the comfortable seating area. 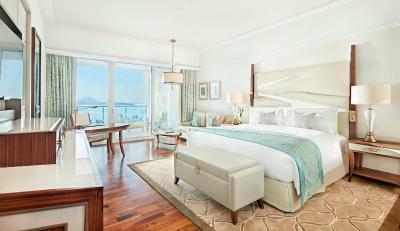 The private bedroom features a walk-in closet and signature Waldorf Astoria king-sized bed. The luxuriously large bathtub complements the separate walk-in shower and double vanities. Other amenities include two 42-inch HDTVs, an i-docking station, a coffeemaker, WiFi and a personal Concierge. Sleeps up to 4. Ask the Concierge about complimentary ground transfers, when available, via Bentley Flying Spur to Palm Jumeirah, Marina & The Walk Jumeirah Beach Residence, Burj Al Arab, Souk Madinat Jumeirah and Mall of the Emirates. 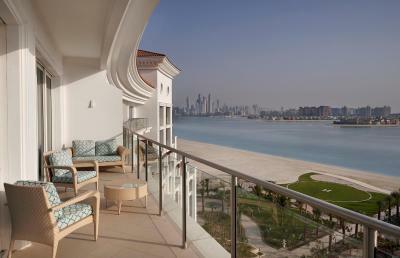 Your spacious balcony showcases beautiful views of the iconic palm Jumeirah and the Arabian Gulf. This spacious deluxe room also features a comfortable seating area, work desk, walk-in closet and king-sized signature Waldorf Astoria bed. Freshen up in the stylish marble bathroom with double vanities, large bath and separate walk-in shower. Enjoy contemporary amenities such as a 42-inch HDTV, i-docking station, coffeemaker and WiFi access as well as an assigned personal concierge to enhance your experience. Sleeps up to 3 people; interconnecting rooms are subject to availability. 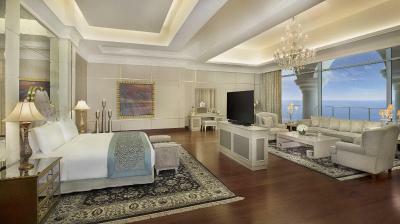 Beautiful views of the azure Arabian Gulf and the world-famous Dubai skyline wait you in this spacious deluxe room featuring a comfortable seating area, work desk, walk-in closet and king-sized signature Waldorf Astoria bed. Freshen up in the stylish marble bathroom with double vanities, large bath and separate walk-in shower. Enjoy contemporary amenities such as a 42-inch HDTV, i-docking station, coffeemaker and WiFi access as well as an assigned personal concierge to enhance your experience. Sleeps up to 3 people; interconnecting rooms are subject to availability. 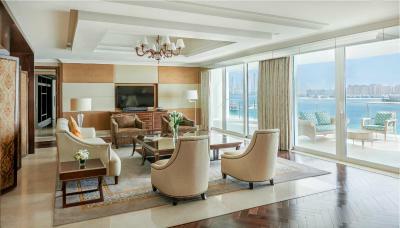 Experience a truly memorable stay in this elegant 55 sq. m/592 sq. 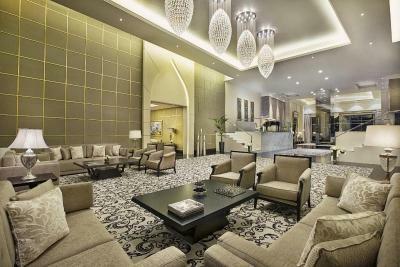 ft. room, offering a exquisitely furnished balcony as well as a comfortable seating area, work desk, walk-in closet and a king-sized signature Waldorf Astoria bed. Freshen up in the stylish marble bathroom with double vanities, large bath, and separate walk-in shower. Contemporary amenities include a 42-inch HDTV, i-docking station, coffeemaker and WiFi access as well as an assigned personal concierge to enhance your experience. Sleeps up to 3 people; interconnecting rooms are subject to availability. 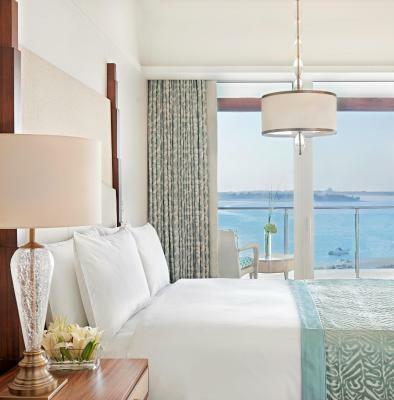 Take in beautiful views of the iconic Palm Jumeirah and the Arabian Gulf from the spacious balcony of this spacious deluxe room featuring a comfortable seating area, work desk, and two queen-sized signature Waldorf Astoria beds. Freshen up in the stylish marble bathroom with double vanities, large bath and separate walk-in shower. Enjoy the convenience of a personal concierge and contemporary amenities such as a 42-inch HDTV, i-docking station, coffeemaker and WiFi access. Sleeps up to 4 people; interconnecting rooms are subject to availability. Guests in this room can enjoy a comfortable seating area, a work desk, a spacious walk-in closet and a signature Waldorf Astoria king-sized bed. 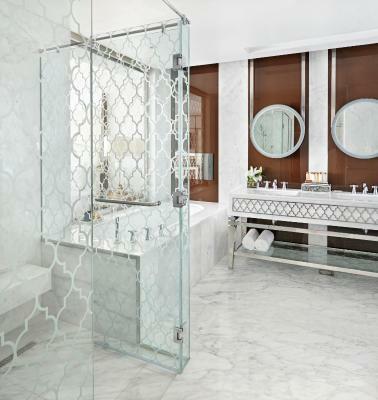 Refresh in the stylish marble bathroom with double vanities, a large bath and separate walk-in shower. Contemporary amenities include a 42-inch HDTV, i-docking station, a coffeemaker and WiFi access. Assigned personal concierge to ensure guest experience. Sleeps up to 3 people..
•	Two marble bathrooms with a luxurious bathtub, separate walk-in shower, and double vanities. 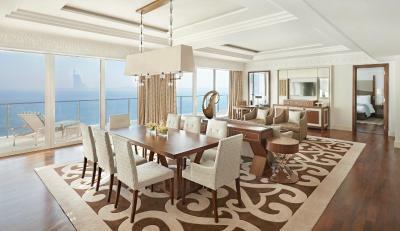 •	Living room and bedroom space, Palm or Gulf view, large balcony and dining table. •	Entertain in style, with a dining table and a comfortable seating area. •	42-inch HDTV in the living room and in both rooms offering premium channels. •	I-docking station, coffee machine and Wi-Fi. This room offers a partial sea view, a furnished balcony as well as a seating area, work desk, walk-in closet and a king-size signature Waldorf Astoria bed. 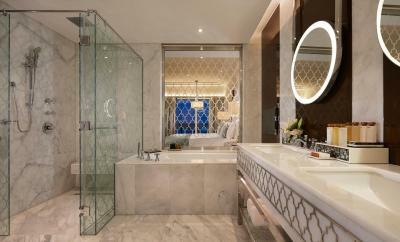 The marble bathroom features double vanities, large bath, and separate walk-in shower. Amenities include a 42-inch HDTV, i-docking station, coffeemaker and WiFi access as well as a personal concierge to enhance your experience. 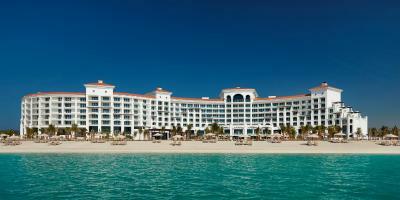 Waldorf Astoria Dubai Palm Jumeirah is a remarkable destination. 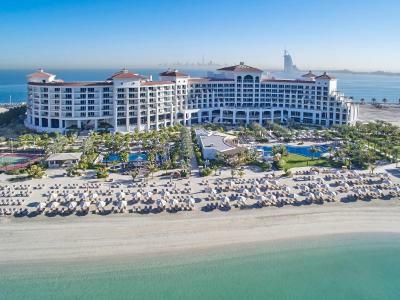 A pristine white pearl surrounded by the azure waters of the Arabian Gulf, it has a generous private beach with soft sands, palatial public spaces and luxurious guest rooms and suites . Distinctive dining awaits at the hotel’s signature restaurants, including ‘Social’, a contemporary Italian dining experience by Italy’s renowned and Michelin-starred chef Heinz Beck bringing together Dubai’s social elite and international leisure travelers, for the most memorable occasions and unforgettable events. 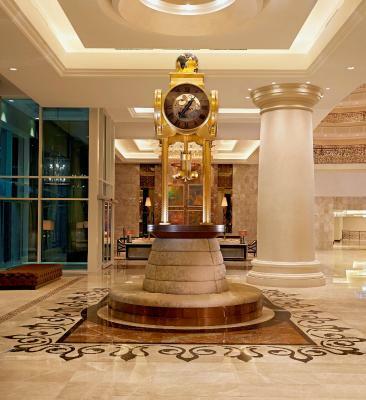 Waldorf Astoria Dubai Palm Jumeirah is part of an exclusive collection of properties known for offering True Waldorf Service, inspirational environments and unforgettable experiences. 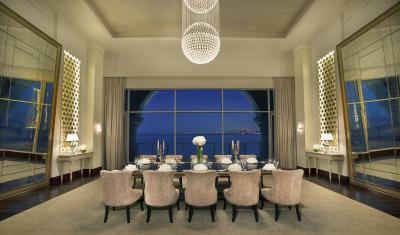 House Rules Waldorf Astoria Dubai Palm Jumeirah takes special requests – add in the next step! Waldorf Astoria Dubai Palm Jumeirah accepts these cards and reserves the right to temporarily hold an amount prior to arrival. 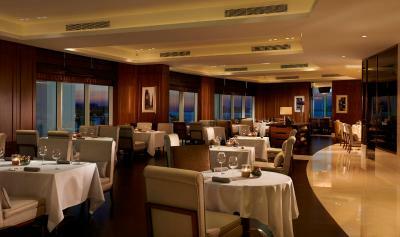 Social by Heinz Beck restaurant welcomes children above the age of six years. Children above the age of 12 years are welcome in the Waldorf Astoria Lounge from 17:00 hours onward and the dress code is smart casual from 17:00 onward. 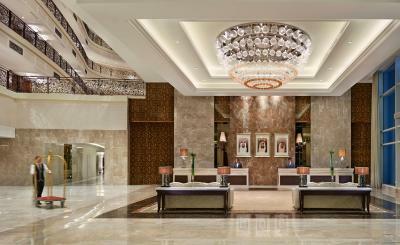 Please note that guests are required to present their valid passports and valid Emirates ID upon arrival and check-in. Kindly note that the original bank card used for the payment must be presented upon check-in. Did not like the location, middle of nowhere, Around is nothing, no store, restaurants, only the one in resort . Near by is Atlantis , only 2 line round to get out of the island. Food too expensive and look better then taste. 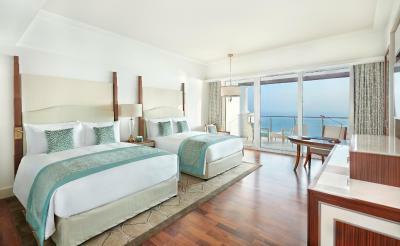 Nice resort, comfortable bad, great beach, clean and comfortable room. Our room location was very disappointing we looked onto a wall and a industrial plant of some description, we chose the location due to the beautiful views. Sadly disappointing. We had a lovely balcony too, such a waste and wouldn’t return . Nothing. A truly exemplary hotel! 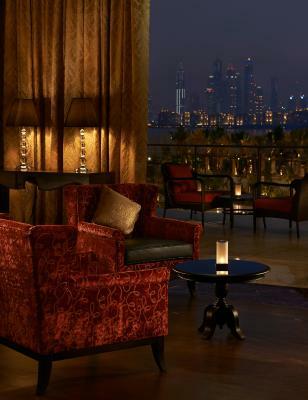 Comfort: music can be heard on the Burj side of the hotel until early in the morning. Not from within the hotel, unsure where from, but it could be heard until about 4am. Value for money: prices are extremely high when at the hotel. Typical for Dubai I think but unnecessarily expensive. Staff were amazing. Hotel was so clean. Room was amazing and so clean. Beach was great. Breakfast was fabulous. Food, especially room service, is wide in choice and absolutely delicious. 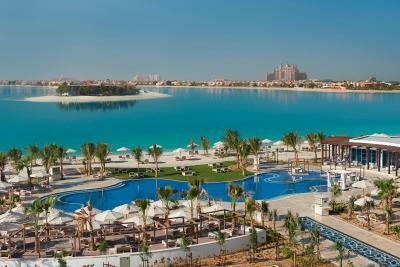 I do not have any negative comments about the hotel, having been to Dubai before, this was another very pleasant stay. 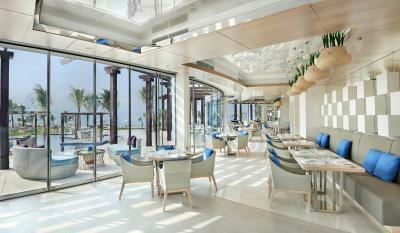 ON site restaurants, for a casual dinner/lunch do not have much option. We were travelling with very young children, and hence fine dining was not really a option Overall facilities are average for the price you pay. Amazing hotel couldn't fault it.You definitely get what you pay for. Room was excellent staff round the pool were really helpful & check in staff were really good. Would definitely stay here again.